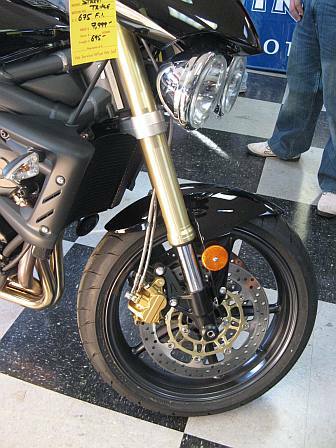 If you want a glowing Triumph Motorcycle Review, then you've found the right page. 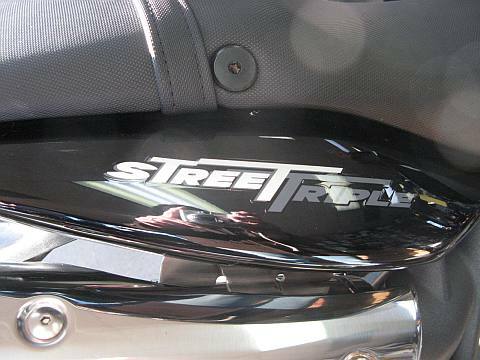 The 2008 Triumph Street Triple with a dry weight of 367 pounds, and a seat height of 31.4 inches - AND, a MRSP of less than $8000, is a model that should be considered as a great starter bike for any woman motorcycle rider looking for a great sport bike. I've seen this baby in person, sat on it, whipped it up from a lean and fell in love. Reminiscent of my flawed little Ducati, this bike is lightweight and naked. No windscreen, mini front fairing, no weighty parts to slow it down. The Street Triple has a displacement of 675 cc, and a 6-speed transmission - and is a "milder gentler" version of the rabid Speed Triple. (Which is not a bike for the street, rather designed for racing) This model is also a stripped-down version of the fabulous Daytona 675 - a model I also lust over. Is there anything about this bike I don't like? The price is tempting - especially for someone who would like a great looking, lightweight performance motorcycle. Great in the curves and powerful on the straight-aways, this bike looks like a comfortable, affordable way to blow the boys off the highway! The big dual headlights are also an attractive addition. And, as an option, you can trade the stock seat for a gel-padded one. 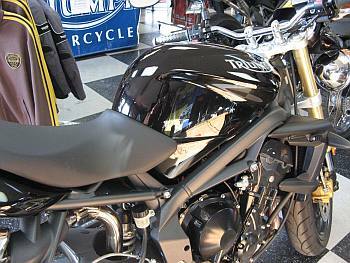 I look forward to test driving this model in the Spring, and after doing so, will update this Triumph Motorcycle Review with some personal remarks.